So irrigation practices such as continuous irrigation, or frequent application of excessive volumes will actually reduce the meadow’s value for livestock production. The practices also can have negative water quality impacts by increasing runoff rates. 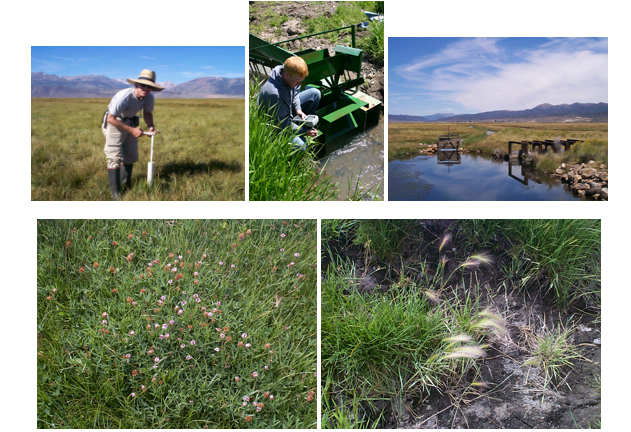 We examined correlations between soil moisture/depth to water table, forage production, and forage quality in several large irrigated meadow systems in the Sierra Nevada. 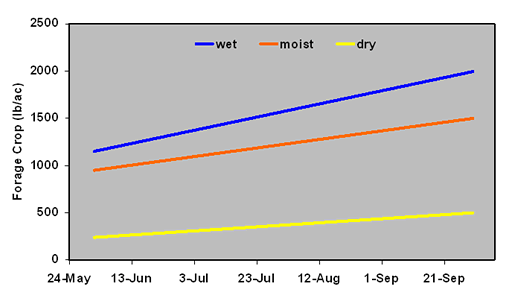 To do this, we have simultaneously measured soil moisture status, forage production and forage quality (i.e., crude protein, digestibility, energy, and macronutrients) over the course of the growing season (~April through September). 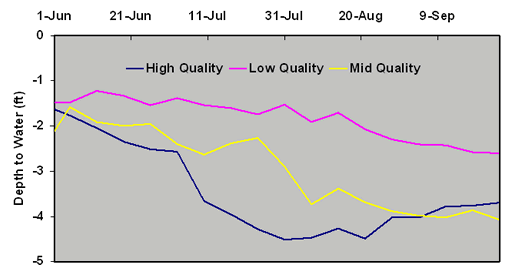 We measured soil moisture, forage production – quality across sites with low to excessive irrigation. Consistently high water tables lead to less palatable plant communities. At Bridgeport Valley in Mono County, we found that the type of plants associated with a consistently high water table level tend to be low palatability species. High palatable species such as timothy, bluegrass, and clovers tend to be associated with moist soil conditions, but with water table deeper than 2 ft most of the growing season. We grouped 36 sites from meadows across the upper Feather River watershed into soil moisture categories of wet, moist, and dry. 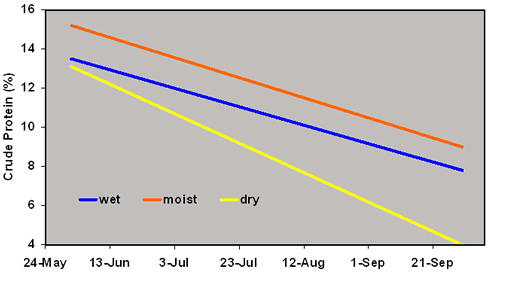 While the wet sites produce somewhat greater amounts of forage, the moist sites maintain higher forage quality. Wet sites produced more vegetation, but the moist sites produced higher quality forage. Irrigation in response to plant and soil water demand will make more efficient use of water, produce a higher quality forage crop, and reduce runoff and pollutant transport. Monitoring of soil moisture status would provide the manager real-time feedback on moisture status and the need for irrigation.